Introduction: Adverse events are common in medical training and practice, which can lead to distress among providers. One method of coping with distress is debriefing, which has been shown to improve participants’ ability to manage their grief and has been associated with lower rates of burnout. Methods: We designed this 2-hour workshop to provide senior residents with the knowledge and skills to lead debriefing sessions within their teams. In this curriculum, we have included a workshop facilitator’s guide, didactic information reviewing the components of effective debriefing, a video of a sample debriefing, two videos demonstrating potential debriefing challenges, small-group practice cases, a debriefing pocket card resource, and pre- and postworkshop survey evaluations. Results: Twenty second-year pediatric and medicine-pediatric residents were included in the pilot study of this workshop. They reported an average of 2.2 (SD = 2.4) distressing events in the preceding month. None of the residents had received previous training in debriefing, and only 10% had previously led a debriefing session. Pre- and postintervention surveys demonstrated significant increases in resident comfort in and likelihood of leading a debriefing session, as well as in recognition of personal distress. Discussion: This workshop serves as one model to enhance training and education regarding debriefing in residency training programs. The issue of distress is not unique to residents, and although this training was initially designed for that population, it could easily be adapted to reach a broader audience of medical trainees and providers. Identify symptoms of distress in themselves and others. Explain the value of debriefing as a method of coping with distress. Describe the components of an effective debriefing session. Evaluate a debriefing session and make suggestions for changes. To assess resident experience and attitudes regarding debriefing at our institution, in the fall of 2016 we administered a needs assessment, which consisted of an electronic survey and focus groups. The survey had a response rate of 48% (48 out of 100 residents queried), with 44 fully completed entries. Distressing events were defined as any patient care experience that caused distress amongst the care team. Examples were also provided, including a patient death, medical error, or other serious adverse event. Ninety-one percent of respondents (44 out of 48) reported having been involved in at least one distressing event in the preceding 12 months. On average, respondents reported that 38% of events had a debriefing session within the first week, though there was significant variation (SD = 27.11). Most of the debriefing sessions were led by attending physicians. Of residents who had experienced a debriefing session, 97% (35 out of 36) rated the session as at least moderately helpful, with 69% describing debriefing sessions as very or extremely helpful. Over 95% of respondents (43 out of 45) rated debriefing sessions and being proficient in leading debriefing sessions as at least moderately important. However, 51% of respondents (23 out of 45) felt at least moderately confident to do so, and only 5% (three out of 45) felt very or extremely confident. Only 3% (one out of 44) had received formal training on how to lead a debriefing session. Eighty-one percent of respondents (36 out of 44) were interested in receiving training in debriefing. We created a workshop to teach the skills of debriefing as one method to address distress following difficult patient care events. We chose senior residents as our initial target audience as a way to promote resident wellness by empowering them to lead timely debriefing sessions within their teams. The workshop used a variety of instructional methods, including didactics, small- and large-group discussions, and role-plays. To date, MedEdPORTAL has offered two other resources on teaching the skills of debriefing. The first resource includes brief training in team debriefing as part of a larger workshop series focused on resilience training.13 The second resource is a targeted peer-to-peer debriefing intervention for pediatric residents to perform in pairs.14 While our workshop employed a similar debriefing framework, we emphasized the use of debriefing within patient care teams and thus included role-playing scenarios to be done in small groups. We also offered videos to role-model debriefing in a standard and reproducible manner, as well as to troubleshoot common challenges that might arise during debriefing. Our workshop participants provided feedback that both the modeling beforehand and the role-playing with expert feedback afterward were particularly beneficial to their learning. We also included a pocket card to be used as a quick reference; this card could be edited by future users to reflect the resources available at their own institutions. Finally, this workshop was designed with input from an interdisciplinary, multispecialty group, increasing its generalizability to a wider range of clinicians. Workshop overview and objectives (5 minutes). Principles and process of debriefing (20 minutes). Small-group debriefing practice (55 minutes). Large-group reflection and wrap-up (10 minutes). We opened the session by asking residents to think about a recent patient care event that caused distress in either themselves or other members of their team. We directed participants to share amongst their small group the supports they utilized in that situation. Returning to the large group, we asked participants to call out answers that their small groups had discussed; we wrote these answers on a whiteboard. We then transitioned into the didactic portion, with Morgen Govindan introducing the benefits of debriefing, followed by the objectives and outline of the workshop. We shared the results of our needs assessment, highlighting the lack of confidence in leading debriefings and the interest that the participants’ peers had expressed in receiving training on debriefing. Nasuh Malas, the senior mentor on this project, a child and adolescent psychiatrist, and the director of our inpatient pediatric consultation-liaison psychiatry service, then presented the principles and process of debriefing (Appendix B). We performed a model debriefing session, using case 1 of the small-group cases (Appendix F). We have created a sample debriefing video (Appendix C) to be shown during this portion of the workshop for standardization purposes. After viewing the model debriefing session, participants returned to their small groups to practice leading debriefing sessions using the two additional case scenarios. We had two residents lead each case, switching at the approximate halfway mark, so every resident could have experience in this role. The halfway mark was determined by progression through debriefing rather than being an artificial time point in order to allow each person leading a debrief to naturally transition midway through it. After each practice case, there was time to reflect and give feedback on the debriefing. Members of the pediatric palliative care and pediatric consultation-liaison psychiatry teams served as small-group facilitators and helped to provide specific feedback. We then returned to the large group for a final discussion and wrap-up. 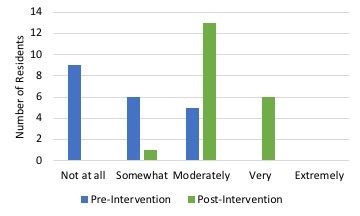 Afterward, participants completed the postintervention survey. More detailed instructions for implementing this workshop can be found in the facilitation guide (Appendix A). In addition to the video of a sample debriefing session, we also created troubleshooting videos that depicted how to respond to a participant who was resistant to the idea of debriefing (Appendix D) or a participant who dominated the group conversation (Appendix E). These videos were not shown during the workshop but were made available to the residents on our internal website for future reference. The other workshop materials, including the PowerPoint presentation and pocket card, were also included on the internal website. The survey instruments were initially created by Morgen Govindan and then underwent multiple rounds of feedback and revision with the input of both house officers and faculty on local, regional, and national levels. We used univariate statistics to describe responses to the pre- and postintervention surveys. Surveys were linked with numerical identifiers, and we employed paired t tests to assess changes in responses from the pre- to postintervention period. All statistical analyses were performed using SAS version 9.4. Twenty second-year pediatric and medicine-pediatric residents participated in the pilot study. 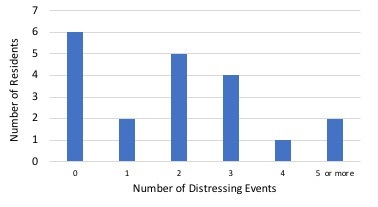 Participants reported a mean of 2.2 (SD = 2.4) distressing events in the preceding month (Figure 1). Debriefing was infrequent, with 10% of residents (two out of 20) reporting having participated in a debriefing session in the previous month. Only two reported that distressing events in the preceding month had corresponding debriefing sessions. No residents reported having previous formal training in debriefing, and only 10% had ever led a debriefing session. Following the workshop, there were statistically significant improvements in multiple domains, including comfort in and likelihood of leading debriefing sessions (Figure 2 & Figure 3). Complete results from the pre- and postintervention surveys are displayed in Table 1 and Table 2.
by residents (N = 20). How important do you think debriefing is after a distressing event? How comfortable do you feel requesting a debriefing session after a distressing event? How comfortable do you feel leading a debriefing session after a distressing event? How likely are you to lead a debriefing session after a distressing event? How likely are you to notice symptoms of distress in yourself? How likely are you to notice symptoms of distress in your junior team members (interns, medical students)? aRated on a 5-point scale (1 = not at all, 5 = extremely). I can identify when debriefing may be necessary. I can describe the components of a debriefing session. I can explain strategies to leading an effective debriefing session. I am competent to lead a debriefing session. aRated on a 4-point scale (1 = strongly disagree, 4 = strongly agree). Adverse events are common in the medical field, and debriefing is one method of coping with the distress these events can elicit. While most residents at our institution believed it was important to personally be able to lead debriefing sessions, they felt unprepared to do so and expressed a desire for training in this area. Our 2-hour debriefing workshop was both well received and effective. We demonstrated significant improvements in resident knowledge of debriefing, as well as comfort in and likelihood of leading debriefing sessions with their peers. This workshop has now been incorporated into our annual second-year curriculum. Although the workshop was originally targeted to senior residents, distressing events affect providers across many aspects of medicine who could also benefit from debriefing. This training could easily be tailored to a variety of health professionals, including fellows, attending physicians, nurses, and nursing leaders. The greatest challenge we faced in implementing this project was protecting the targeted residents from clinical duties so that they could attend the workshop. Due to scheduling constraints, only 20 out of 32 second-year residents were able to attend the initial session. Incorporating the workshop into the annual curriculum with support from our program administration has helped improve our ability to optimize participation. This study has several limitations, including the small sample size from the pilot workshop and the inclusion of residents from only a single institution. 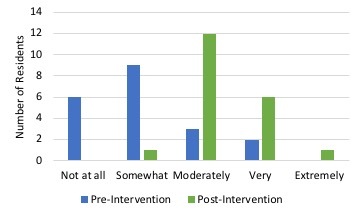 Using pre- and postintervention surveys introduced the possibility of response bias, with respondents potentially giving more desirable answers that could affect the validity of the assessment. Additionally, the surveys have not been psychometrically validated. The initial surveys did not measure the durability of the learning, which would need to be assessed over time, or whether the workshop changed residents’ behavior by promoting them to actually lead debriefing in appropriate situations. Future directions include surveying the participants of the pilot workshop to check for sustained improvements in their knowledge of and comfort with leading debriefing and assess whether they have put this knowledge into practice. In addition, other programs at our institution, including fellowships, have expressed interest in adopting this workshop with their learners. Other future directions may include the development of a tool to assess the quality of debriefing and standardized observations to determine the level of skill change resulting from the workshop. Govindan M, Keefer P, Malas N. Cultivating opportunities for reflection: teaching the art of debriefing. Presented at: Annual Assembly of Hospice and Palliative Care; March 14-17, 2018; Boston, MA. Govindan M, Keefer P, Sturza J, Malas N. Effective debriefing: empowering trainees to process distressing events. Poster presented at: Association of Pediatric Program Directors Annual Spring Meeting; March 20-23, 2018; Atlanta, GA. The University of Michigan Institutional Review Board approved this study. Committee on Palliative and End-of-Life Care for Children and Their Families. When Children Die: Improving Palliative and End-of-Life Care for Children and Their Families. Washington, DC: National Academies Press; 2003. Accreditation Council for Graduate Medical Education. ACGME Common Program Requirements. Accreditation Council for Graduate Medical Education website. https://www.acgme.org/Portals/0/PFAssets/ProgramRequirements/CPRs_2017-07-01.pdf. Revised February 2017. Keene EA, Hutton N, Hall B, Rushton C. Bereavement debriefing sessions: an intervention to support healthcare professionals in managing their grief after the death of a patient. Pediatr Nurs. 2010;36(4):185-189. © 2019 Govindan et al.